All the talk this week about sellout crowds and student sections at the University of Hawai’i basketball games has been great, but the bottom line is this: the Warriors need to win a game against Long Beach State on Saturday night to keep pace atop the Big West Conference. Hawai’i is off to its best start since the glorious “Fabulous Five” season of 1971-72, with an overall record of 16-2. The Warriors are 5-0 in the Big West, and a half-game behind 6-0 UC Irvine (the Anteaters play UC Santa Barbara on Saturday). 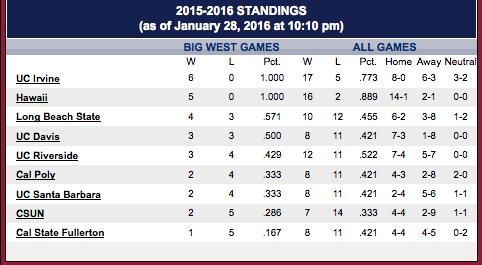 Long Beach State is 10-12 overall and in third place in the conference at 4-3. The 49ers arrived in Honolulu less than 24 hours after an 80-70 overtime victory over UCSB on Thursday night at Long Beach, Calif. The largest crowd of the season is expected at the Sheriff Center, perhaps even the first sellout since 2004. The 49ers’ overall record is a bit deceiving, as they played one of the strongest non-conference schedules in the country. Among their 12 losses are road games at Oklahoma State, UCLA, Oregon, Arizona and Duke. Their three conference losses are by a total of 10 points. The 49ers feature one of the conference’s dynamic players in 6-foot-6 guard/forward Nick Faust. The senior transfer from Maryland is averaging 16.3 points, 5.6 rebounds and 2.4 assists per game. He also leads the 49ers with 57 3-pointers and 29 steals. He just scored a season-high 34 points in the win over UCSB on Thursday. Another key player for Long Beach is sophomore point guard Justin Bibbins, who is averaging 11.7 points, 5.2 assists and 3.1 rebounds per game. 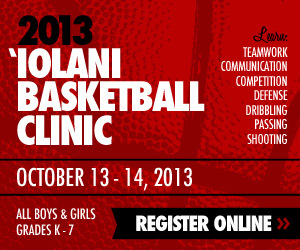 He played on the same high school team (Bishop Montgomery) as UH players Stefan Jovanovic and Niko Filipovich. The other main contributors include sophomore forward Gabe Levin (9.7 points, 5.8 rebounds per game), junior forward Travis Hammonds (9.2 points, 5.1 rebounds per game) and senior guard A.J. Spencer (9.2 points, 3.2 rebounds per game). The 49ers lead the Big West in 3-pointers per game (9.0) and 3-point percentage (.387). Five different 49ers have made at least 25 3-pointers this season: Faust (57), Bibbins (37), Noah Blackwell (33), Travis Hammonds (32) and A.J. Spencer (25). 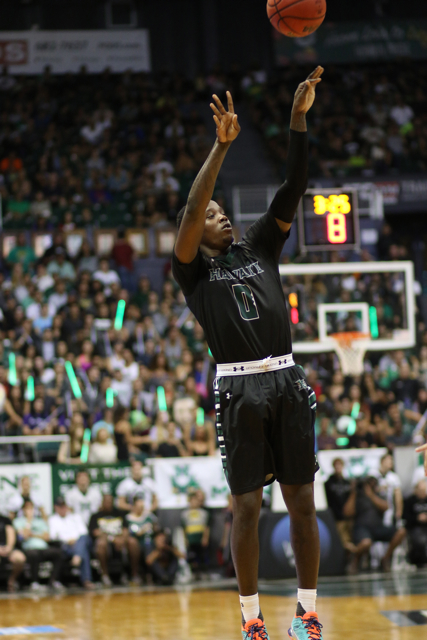 Hawai’i leads the Big West in scoring (80.4 per game), field goal percentage (.472), assists (16.4), and steals (8.4). Junior forward/center Stefan Jankovic leads the Warriors in scoring (15.6), rebounding (6.5) and field goal percentage (.577). Senior point guard Roderick Bobbitt is averaging 13.2 points per game and leads the Big West in assists (5.4) and steals (2.3). Bobbitt and Bibbins rank 1-2 in the Big West in assists. Fleming is averaging 11.8 points per game overall, and 18.2 points per game over the last four games. The Warriors could be boosted by the return of junior forward Aaron Valdes, who has missed the last three-plus games with a turf toe injury. He is averaging 14.8 points and 5.3 rebounds per game. The Warriors are aware that there is a possibility of a capacity crowd on Saturday night. When: Saturday, January 30, 8:00 p.m.
Tickets: Lower Level – $26 for all available seats; Upper Level – $18 for adults, $16 for senior citizens (ages 65-older), $5 for students (ages 4-18). Parking is $6. Doubleheader: The UH women’s team will play UC Irvine at 5:30 p.m.; fans with tickets to the UH men’s game can enter early and watch the women’s game. Promotions: Pepsi will be awarding a year’s supply of Pepsi products during a halftime contest. Fans can register for a chance to participate at Gate A. Theme Night: “Cartoon Character Night” – UH students will be dressed as Minions; all fans are encouraged to dress up as cartoon characters. Long Beach State at Hawai’i, 8:00 p.m.
Warriors Win By 20 final score, .. 101-81…guaranteed ! Before 10,300 in house sell out !! Where do the fans with men’s season tickets sit if they come early and if their seat is occupied by a women’s season ticket holder ? I guess somewhere else. Can someone with a women’s ticket stay for the men’s game ? Islandman: The only anomaly are those who are women’s season ticket holders and not men’s season ticket holders, and yes, they have been told they can stay and find an open seat (and I suppose UH knows how many they have so will sell that many free total?). Yes, if you are men’s season ticket holder only and come early and your seat is taken, find another seat until women’s game is over. Ticket’s sold for non season ticket holders today will all be for BOTH games…cannot buy for only women’s game…BUT seating for women’s game is still general admission. Media from UH saying the Women season ticket holders, I don’t know whether a thousand of them or so, SSC will provide a section, or blocked off seats for them, … I don’t know what is Fire, seating Bldg code rules, however very sure, SSC can even put out temporary chairs, on floor level and a few on concourse not blocking Exits or entryways, main paths. Kind of interesting, for those about thousand that do go to WBB games, if a double header with MBB following them, several of them go home. They are die hard WBB followers. They could catch the MBB game on TV..Very certain, Rich Sheriff will figure out something… You know, Stan Sheriff envisioned the Arena to expand, literally.. like a Dome roof, if you were there from beginning, it can go upwards, easlily ad more row going skyward, .. there was talk of expanding SSC to at least 12, 300;;;they wanted too. at least a 15,000 seater, which is good for NCAA Basketball championship regionals. too. Shout-out to Jamie, Jakob, Sai, Niko and the young lady for the minion work and the dorm residents. That is something that Isaac mentioned the Fabulous Five who played more than two decades before he was born, and that’s not the Michigan Fab Five. Not easy going door to door like a fuller brush man, but they are selling something better. Hope the free pepsi product includes bottled water, better than too soda. But can’t bite the hand that feeds you. I’m sure seating, for both the students and Wahine season-ticket holders, will work itself out. I just checked the online ticket site and there are still lots of tickets available. Interestingly, the section where my seats are was “sold out” a couple days ago. This morning, there are about 10 seats available. Not sure what happened there, unless ticket personnel are making a conscious effort to double-check available seating. Even if it’s a sellout, there will likely be open seats here and there because of no-shows. If you’ve even been to the arena when it was sold out — like in the AC/Alika days — there were still empty seats. Traffic, on the other hand, could be a b—-. But so worth it! The game with Long Beach State is a rehearsal for the real game against Irvine. Not to put a light on the Beach. It’s going to be a battle. But as far as fan interest and decibels that’s the game where the roof will explode. So if Long Beach is a storm, Irvine will be a hurricane. It’s only going to get better from here on out. And everyone thought Hawaii was a football state. Now we got the arena, we got the crowds, and we got the team to take us to the fabulous land. clyde that is real ! Even for pro bowl first 2 years, announced at Aloha Stadium sellout 50300 in the house, with sideline persons counted.. Such a novelty and a lot of OUTSIDE of Hawaii attendees.. could not really see ANY empty seats.. good thing at that time No fights or, fire..! This sellout of 10300 tickets will be feather in the cap not for Matlin, Bley V. or Lassner, Ganot. FOR THE TEAM.. the Admirable Adversity Army of 14.. at least 9 have come through the storm of couple of years. .and are on to NCAA and maybe elite eight? I think so..if healthy..
Yeah, UH MBB, if top 25 rank every year.. should have 8000 in the house EVERY game, no matter if they are playin the Canadian YMCA 40 and over team, or they are playing Linfield College. like back in the Fabulous Five, Nash days.. magic. Go Bows.. and guaranteed.. there will be at least a thousand seats.. in between .. available. so actual turnstile.. unless SSC staff counter, hedges. and makes like the hanging chads of Florida election years ago, recount remember? Actual attendance, my prediction? 9300 in the house. , which is FANTASTIC. better than any BWC team ! NOW HAVE TO SELL OUT REMAINING SSC home games and Especially Senior night ! Rolo, go dorm to dorm too.. get that Aloha stadium average home attendance at 35, 0000 would be start ! And Wade and MVB. a nice 3500 home attendance average would lead the MSPF league or be one of the highest. FIRST THING.. get Football to average 35 , 0000… and other sports follow. ! KellyO.. how is this for PREDICTION.. UH will go undefeated in BWC regular season play 16-0 !! Anaheim, crap shoot, so take your antacids.. and get hydrated, enough sleep and oxygen, check your blood pressure and help UH MBB take the crown in Anaheim ! All we have to do is BEG. Believe in Eran Ganot!!!! He has his team prepared and rested. ONLY WAY, LBSU can distract, attack, and walk away with forfeit, or suspension for both teams, and have this game not count.. I am serious.. would not recommend.. UH has to be a 14 point favorite, right ? at home SSC. I would love to see game go down to wire…test for rookie coach and team not tested yet.. Cool article by vice sports. Monson, use the bench those 6’5″ TO 6’8″235 POUND BENCH GUYS..HAVE TO GET INTO A MMA rumble, boxing, pushing shoving stratching, almost a RIOT.. ONLY way LBSU can get forfeit or win.. have UH , about 4 key guys get thrown out of game.. UH is THAT GOOD AT home, and with crowd.. unbeatable.. either that, or any shots LBSU takes, from field or FT/ 3 line, 70 percent or better goes. in.. ONce UH turns 49ers over, gets out and runs in second half , build up lead to 14 to 16 points.. IT IS ALL OVER.. So Monson.. either rough it up, almost MMA fights, and get guys thrown out of game for UH team, OR shoot lights out, from open tip till final buzzer. WARRIORS are that tough.. SO MONSON GOTTA GET ROUGH.. stay even on the boards and shoot lights out. Bibbins the little 5’8″ guard has to control pace tempo. for LBSU>. he might be the only one to be able to handle the UH guard defensive pressure..
Great Game.. One for the centuries, I am excited. the WBB team? seems to be going backwards? Beeman, deserve another 3 years? I don’t know..we see,..
Eh…tonight they’re having party in Chinatown. They should start the game off with the firecrackers at the Stanley!! Hehe. Das my Pake blood coming out. Yeah, I’m excited. Uhfanz…16-0…funny guy. STOP!!! Looks like UC Irvine first conference loss tonight.